I'm a foreign-language teacher. That means that assessment must include oral testing. Last year, my school got me a set of Chromebooks, which led to one problem. 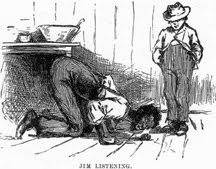 Instead of two jacks for microphone and headphones, there was just one jack. Students who had their own two-way earphones found the transition easy. 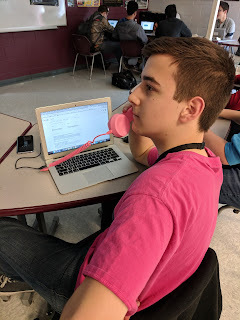 Students who used my dual-jack headsets had to plug in the audio cable and talk loudly into the tiny mic at the top of the Chromebook's screen. This year I used some of my BEP money to purchase some retro-looking handsets from Amazon (full name: WinnerEco 3.5 MM Retro Radiation Proof Phone). I knew that my first unit of German 2 would be over phone conversations. I thought it would add some "cool" to oral quizzes. I ordered every color of phone I could find. Out of the box, to be honest, they feel a little cheap. Everything is plastic, and the cord is much thinner than the old lines I remembered. There is a volume button on the side, and a button at the center of the handset which can be used to pick up or hang up a call when it is connected to a cell phone. The quiz went smoothly. I'm happy to have a fun new tool for future assessment.